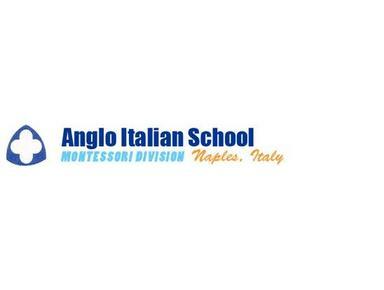 The Anglo-Italian School, Montessori Division is an international school of preschool through 10th grade students. The school, founded in 1958 by a group of NATO parents, is located in a secure setting on the NATO, JFC HEADQUARTERS Command Base. The school's beautiful setting overlooks and has panoramic views of the Bay of Naples. Mount Vesuvius and the Isle of Capri are both visible through the classroom windows. The multi-cultural student body is comprised of dependent children of NATO countries, military and diplomatic personnel and the host nation - Italy. The base provides both a secure environment and an international setting for your child's schooling. The school administration has invested in renovations to provide clean and attractive surroundings for the students, and to ensure all standards required by Italian and European laws are met. The school has beautiful recreational area’s in addition to access to NATO’s modern physical education facilities. All teachers are mother tongue English speakers and except for foreign languages, classroom instruction is in English. Most teachers are certified in the United States, and from other English speaking countries. The school has a very intensive ESL program for students who arrive with limited English skills. The school follows an international and USA curriculum, tailored using the best models of various international associations. All the textbooks and educational materials are from the USA and other English speaking countries. International cooperation and cultural exchange as well as foreign languages are emphasized. All students are multi-lingual when they leave the school. Montessori philosophies and instructional techniques are used. Small classes provide for individual instruction and attention and ensure that each student reaches his or her full potential. Information technology is also used in research and to augment traditional instruction. The demanding curriculum provides excellent preparation for both classical and scientific follow-on study.